Last Thursday, I had my first speaking event. 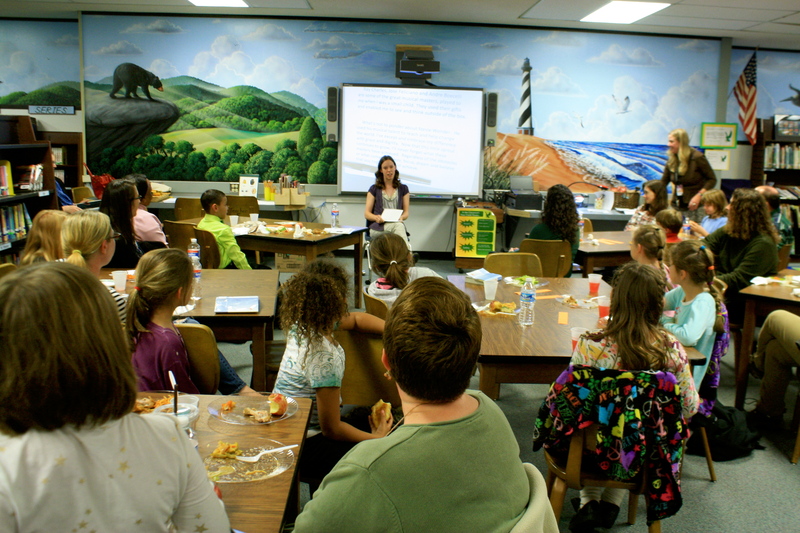 I spoke to an elementary school book club in Asheville who had read Out of My Mind, in which the main character in the novel has Cerebral Palsy, the same disability I have. I was asked to come and speak about being bullied in school because of my Cerebral Palsy. When I was 7 years old, I played on a coach’s pitch baseball team, and there is one game I’ll never forget. I was up to bat, and my coach, Mr. Mark, stood on the mound smiling at me. He pitched the ball, and even though I hit the ball, it didn’t go far. It landed close to Mr. Mark’s feet. There was a player from the other team standing behind Mr. Mark, but Mr. Mark grabbed the ball and kept it away from the other player. At first, as I was running to first base, I didn’t know what was going on. I just knew that the first baseman hadn’t caught the ball yet, so I kept running. As I was almost near third base, the biggest grin spread across my face as I realized what Mr. Mark had done: he was giving me my very first home run. I remember running as fast as I could from third base to home plate, and as soon as my feet touched home plate, everyone in the crowd jumped to their feet and cheered for me. In that moment, I got to be a normal kid, and I got to feel the happiness that comes with completing a home run. If only for one night, I wasn’t a girl with Cerebral Palsy. I was a baseball player, a team member, and probably one of the happiest people in my hometown, if only for a moment. Just like the character of Melody in Out of My Mind, I have Cerebral Palsy. Though I am not in a wheelchair or unable to talk like Melody, my Cerebral Palsy affects the way I walk because my muscles are really tight and because I don’t have very good balance. Because of being physically different, I was always an outcast in school. I had trouble making friends, and it was hard not having someone who knew what I struggled with on a daily basis. When I walk, it is very evident that I am different, and because of my visible differences, I was an easy target for bullying in school. I had my first bullying experience when I was in kindergarten. At that age, I had to use canes to help me walk. Because of having to use canes, I wasn’t able to walk very quickly, and there was a girl named Ashley who enjoyed picking on me because she knew I wouldn’t be able to run away. Every day on the playground during recess, Ashley came up behind me and pulled my hair. It wasn’t a friendly pull either. She grabbed a fistful of my hair and yanked as hard as she could, laughing as I screamed in pain. She pulled so hard that I couldn’t even try to get away from her. Every day, I came home crying, and every morning, I woke up dreading having to go to school and see Ashley on the playground. I felt like crying when I realized I was completely alone. No one was sticking up for me, and it made me really sad. One day, my teacher, Miss Sandy, came up to me and told me to hit Ashley with one of my canes to help her realize that what she was doing was hurting me. See, Ashley was mentally disabled, so she didn’t know any better, and hitting her was one of the only ways Miss Sandy knew to make her stop. I never did hit Ashley though. I couldn’t do it. Hitting her would make me just like her: someone who wanted to hurt someone else. I don’t think Miss Sandy really wanted me to hit Ashley though. She was just trying to teach me the importance of trying to stand up for myself. In many ways, it felt impossible. How was I supposed to stand up for myself when it felt like I didn’t have a friend who would stand up for me? I’ve struggled with forming friendships my entire life. As a kid, I wanted friends more than anything. I think that is the reason I never told a teacher that kids were making fun of me. I became afraid that once I told a teacher, the people who picked on me would call me a “tattle-tale” and the other kids would distance themselves even more. Because I was so physically different from the other kids in my class, all I wanted was to feel like I fit in. In my early friendships, many of the people who became friends with me were my friends out of pity. Even though they didn’t specifically tell me that, I could tell it was true. I could tell by the way they looked at me that they felt sorry for me. When I was young, I kept those friendships anyway because all I wanted was a place where I felt like I belonged. Many of those friendships didn’t last long though because most of the people who had been spending time with me left when they got tired of pretending to be my friend. It wasn’t until I became friends with a boy named Tommy in first grade that things began to change. Tommy was the first person to visibly stick up for me. He confronted the people who picked on me, telling them it wasn’t okay to pick on someone who couldn’t help that she was different. Tommy’s friends laughed at him for sticking up for me, but he didn’t care. He stuck up for me anyway and was there for me no matter what. Tommy also saw the numerous people who became friends with me because they felt sorry for me. He knew how much that hurt me. Even though Tommy wasn’t disabled, he saw how I cried day after day when another person I thought was my friend just got tired of trying. Tommy’s presence in my life didn’t stop other kids from picking on me, but I began to feel a little less alone. Even now, I don’t have many friends. However, the few friends I do have are incredibly close to me, and I am happy to say that one of those friends is still Tommy. When I was in fifth grade, I took a required PE class. In my PE class, dodge ball was typically the game of choice. Every week in PE, I was chosen last for dodge ball. I even remember one particular day when one of my friends, Allie, was the team caption. This made me excited because I thought: Yes, finally! I won’t be picked last because Allie will choose me since we are friends. The team picking began, and I waited with excitement for Allie to say my name. I looked towards her with a smile on my face, and my smile faded as I realized she was picking everyone else but me. Finally, it came down to Miranda, a girl who had just broken her leg, and me. It was Allie’s turn to pick, and I started to inch towards her. And then you know what happened? She chose Miranda over me! Miranda, the girl no one liked because she was so mean, and the girl who couldn’t even move as well as me because she had broken her leg. I couldn’t believe it! As I got older, I thought the bullying would stop, but it didn’t. The summer after my sophomore year in high school, I attended a creative arts camp. One day I was walking back from a creative writing class, and out of the corner of my eye, I saw a girl named Lauren imitating the way I was walking. I turned to her and said, “Hey, what are you doing?” “Imitating the way you’re walking,” Lauren said. When I asked her why, she explained that she was supposed to observe people as an assignment for her theatre class. Even though I told her she hurt my feelings, Lauren didn’t listen. As I walked away, I watched as she laughed and continued to imitate me. I ran back to my room and cried, so sad and frustrated that I was still getting picked on. Even at an older age, getting picked on hurt just as much, if not more. Lauren knew what she had been doing. She saw how I cried in front of her, and yet she still continued to imitate me and laugh at me. I couldn’t understand why she would be so mean on purpose. I ended up telling a staff member about what happened, and she contacted the teacher to find out that it was never a class assignment. The next day, though, something good happened. Lauren did the one thing I never thought she would ever do: she said she was sorry. Being bullied, either physically or emotionally, is hurtful for anyone, but it’s especially hurtful if someone bullies you for something you have no control over, like a physical disability. My bullying experiences have affected me my entire life. I remember the details of every bullying experience I’ve ever had. I remember how alone and broken they made me feel, and how it seemed like the bullying would never stop. Typically, kids in school try to be different because they don’t want to blend in with the crowd. For them, it’s important to stand out. In my case, I have always been incredibly different, and all I have ever wanted was to be normal. My differences have never stopped me from trying to be as independent and normal as possible though. I have Cerebral Palsy, and I am a survivor. Speaking at this event was an incredible experience. I was nervous to speak about my bullying experiences since they were a part of my life I had never verbally discussed before. However, it was such a relief to finally talk about being bullied, and it gave me a sense of closure. It was also wonderful to hear from the kids in the book club and answer their questions. One girl in particular asked what my best grade in school was and what was my worst. It truly made me smile because I realized how wonderful it is to hear questions from kids. They make connections many of us as adults seem to have lost as we have gotten older, or maybe kids are just never nearly as shy to ask whatever seems to pop into their head. Either way, it was a great evening. I have even been asked to come back to that same elementary school to speak to the fifth graders, and my contact information has been passed on to two other elementary and middle schools in Asheville. I suppose it’s time to make myself some “business” cards! Book Review: The Midwife’s Confession By Diane Chamberlain. Yesterday I started The Midwife’s Confession by Diane Chamberlain, and I finished it last night. Yep, it was that good. I became a fan of Diane Chamberlain’s novels this past summer, and she hasn’t failed to disappoint. My favorite by her is Between The Silence, since it was the first novel I read by her and one of the few novels that left me shaky at the end, yet longing to hear more of the story. If you’ve never read anything by Diane Chamberlain, I suggest Between The Silence first. What I have to tell you is difficult to write, but I know it will be far more difficult for you to hear, and I’m so sorry. . . The unfinished letter is the only clue Tara and Emerson have to the reason behind their close friend Noelle’s suicide. Everything they knew about Noelle-her calling as a midwife, her passion for causes, her love for her friends and family-described a woman who embraced life. Yet there was so much they didn’t know. With the discovery of the letter and its heartbreaking secret, Noelle’s friends begin to uncover the truth about this complex woman who touched each of their lives–and the life of a desperate stranger–with love and betrayal, compassion and deceit. Told with sensitivity and insight, The Midwife’s Confession will have you turning pages late into the night. I was reading late in to the night, but only one night since I devoured this in one day. I think my favorite part of this was the way Chamberlain focused on certain characters and not others. Also, even though I’ve gotten pretty good at suspecting certain twists in terms of endings of novels, this book threw me for quite a loop….but a really great loop. I just couldn’t put it down. Though I liked seeing the friendship between Noelle, Tara, and Emerson, I would have liked more depth concerning Tara and Emerson’s friendship rather than just trying to understand their friendship through Noelle’s eyes. There are also other picky things I picked up on…like wanting to be introduced to Anna and Haley earlier in the novel….and getting more details concerning Lily. Though Lily is technically the character that’s “the elephant in the room” for Anna, Bryan and Haley, I longed for more details about Lily herself that would’ve showed the beginning connection between Anna and Bryan. However, despite all that, this was an amazing read, and I highly recommend it to anyone who is a fan of Jodi Picoult. The critics don’t lie when they describe Diane Chamberlain as a Southern Jodi Picoult. Book Review: Lone Wolf By Jodi Picoult. 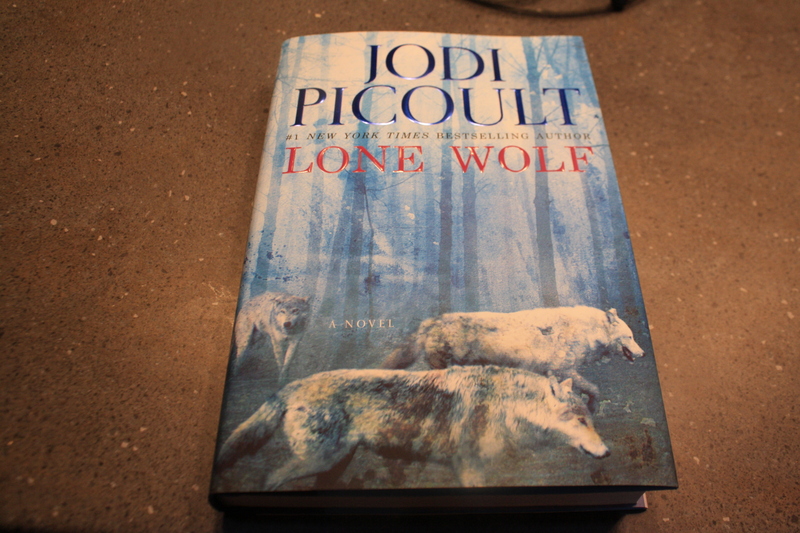 On Monday night, I was sad to have finished Jodi Picoult‘s newest book, Lone Wolf. Jodi Picoult is my favorite author, and I got her newest book on Friday as a treat to myself (since I made it through midterms, and it was the beginning of my Spring Break). The bummer with Picoult’s books is that since I love them so much, I get so hooked that I usually finish them within a few days. This read actually took longer than most since I made myself take breaks. There’s something quite sad about the ending of a book, and so I wanted to try to make the experience last a bit longer. I didn’t have much luck. Ah well, better luck next time….maybe. Edward Warren, 23, has been living in Thailand for five years, a prodigal son who left his family after an irreparable fight with his father, Luke. But he gets a frantic phone call: His dad lies comatose in a NH hospital, gravely injured in the same accident that has also injured his younger sister Cara. Cara, 17, still holds a grudge against her brother, since his departure led to her parents’ divorce. In the aftermath, she’s lived with her father – an animal conservationist who became famous after living with a wild wolf pack in the Canadian wild. It is impossible for her to reconcile the still, broken man in the hospital bed with her vibrant, dynamic father. With Luke’s chances for recovery dwindling, Cara wants to wait for a miracle. But Edward wants to terminate life support and donate his father’s organs. Is he motivated by altruism, or revenge? And to what lengths will his sister go to stop him from making an irrevocable decision? LONE WOLF looks at the intersection between medical science and moral choices. If we can keep people who have no hope for recovery alive artificially, should they also be allowed to die artificially? Does the potential to save someone else’s life with a donated organ balance the act of hastening another’s death? And finally, when a father’s life hangs in the balance, which sibling should get to decide his fate? Even though I’ve loved all of Picoult’s novels, I feel like this one may be one of my favorites. I love that Picoult chose to include the voice of Luke Warren, which gives the reader an invitation into his world…and into the world of his wolves, who have become more of a family to him that the human family he is also a part of. I never really knew how wolves and wolf packs functioned, so that was really interesting for me to learn. Though in all of Picoult’s novels she shows the different dimensions of what it means to be a family, I love that she varied things up. A daughter who believes her father is the moon in her sky. A son who couldn’t feel anymore distant from his father (but due to reasons that aren’t realized until late in the novel). And a wife who is torn between the love that she used to have for her ex-husband and the love that she’s trying to equally show to her children. I was sad for Lone Wolf to be over, but now I’ll just wait for next March to get here! I highly recommend it though. It’s definitely a page turner that will keep you up late into the night! On Saturday, my dad and I headed to Ikea to finally get me some massive bookshelves. I had been hounding my parents for a while due to the fact that the main thing I wanted in my room in our house in NC was lots and lots of bookshelves. On Saturday, that dream came true. My dad and I looked online at Ikea’s website and found a Billy Bookcase that had 3 standard bookshelves and then 2 dvd towers that go in between them for stability. It pretty much spans my whole wall (with a little space on either side for things not to seem so crowded. Anyway, today my dad put together the bookshelves, and while he was doing that, I unpacked my books and put them all in alphabetical order. The first of 3 shelves. 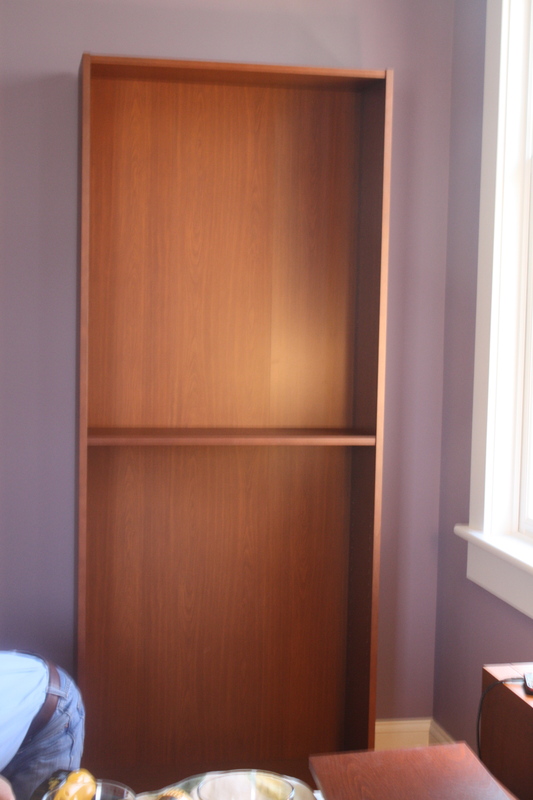 Unfortunately, I wasn’t able to get a picture of the finished bookshelves since I had to leave before my dad finished putting the shelves on. Also, I haven’t shelved the books yet, but I’ll be doing that soon as well (which will probably be the next time I’m at our house up there). 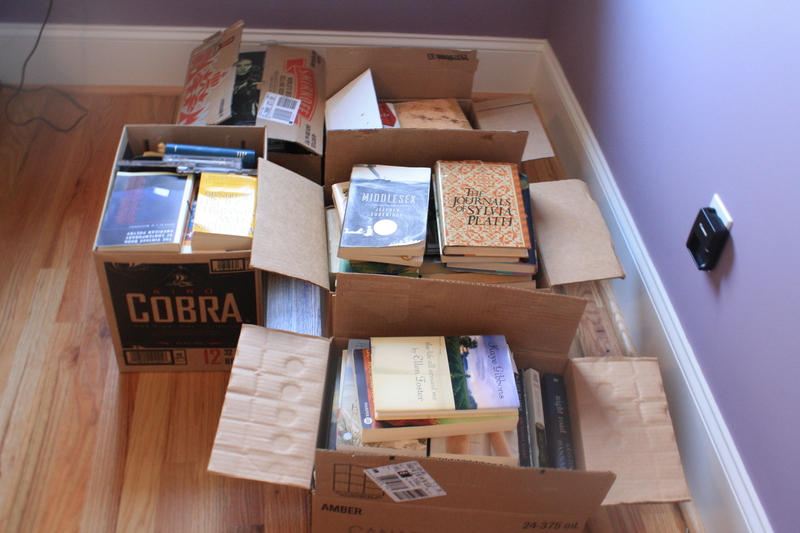 I’m just so excited to have so much space to store books. For as long as I can remember, we’ve had bookshelves, but I’ve always had so many books that I’ve ended up with piles of books on the floor surrounding the bookshelf, so things just got cluttered. I hope having a full wall of bookshelves will eliminate that problem….or maybe I’ll just end up getting a lot more books since I know that I’ll have the space for them. Hmm. Books are just wonderful. Don’t you agree? Who Knows You Better Than You Know Yourself? I’m always amazed at how songs can transport you back to a year, a day, a moment. This morning I heard “I’m Only Me When I’m With You” by Taylor Swift, and I instantly thought of my best friend Skidmore and all of the memories we made at Salem (the boarding school I went to for my junior and senior years of high school). I remember when I met Skidmore. It was orientation in August of 2008, and all the new students were moving in. Skidmore was a senior at the time, and so she was helping move everyone in. Even then, though I didn’t really know her, she seemed interesting. Though it did take us a little while to become close, once we were, it was as if we had been friends for years. In the beginning, Skidmore gave me the run-down of Salem life….explaining some of her best memories and just the ins and outs of dorm living. It wasn’t as if Skidmore was telling me what to do. She just was familiar with everything, so she showed me the ropes. Like I said, it was as if we had been friends for years even though we had just met. I just had this gut feeling that I’d be able to trust her (despite my trust issues), and I just figured that we’d be really great friends no matter what (which has been true). Skidmore was a lover of hugs, and that instantly was a bond between us. Our bond of friendship continued to grow based on our love of country music and many of our views on certain things. I remember one particular night of my junior year. I was having a rough time because of a comment that my roommate had made regarding my CP. It upset me a lot, and I needed someone to turn to. I needed to find someone to open up to about my past. Not just anyone though. I was too upset and hurt to just explain my past to someone who would just listen due to curiosity rather than a genuine sense of caring and concern. So, I turned to Skidmore, and it was one of the best decisions I’ve ever made. I instantly felt relieved (after I got a good bit of the big stuff out), and I still remember how Skidmore reacted. She told me that ever since the first time she saw me, she knew I was different, but not in the sense of my CP, but in the sense of having a fearless attitude towards life. After that night, Skidmore and I became even closer. I found out that she got really attached to friends too, so things worked out in that sense. But after explaining the first bit of my past and knowing that she responded in such a positive way, I couldn’t hold it in anymore. I let all of it out, and Skidmore just listened and commented or asked questions when she wished. It was the beginning of one of the most incredible friendships I’ve ever had. Skidmore and I are very similar. We both get attached to people easily. We love hugs, country music (Taylor Swift in particular), Jodi Picoult, and just other random things. But it’s not those things that make us close necessarily. We trust each other completely, and we both know that we’ll be there for each other no matter what. It’s even gotten to the point now where Skidmore sometimes knows me better than I know myself. She was the first friend to fully understand me, and that means so much to me. It’s not that she knows what it felt like to go through what I did, but she understands the views that I have towards all of it. For instance, I talked to her about my book a while ago. She was the first one of my friends that I went to regarding guidance for my book. Since she knows me so well, I know that she would be able to really help me. She said: “Amelia, in the past you’ve accepted bits and pieces of your past, but I don’t think you’ll accepted it fully. Though you’ve been able to talk about certain memories, you’ve skirted around others because they were painful or scary. This book is going to be one of the hardest things you’ve ever done, because you won’t have the option of beating due to the harshness of the memory, the fear, or the pain. You’ll just have to plunge into it, and have the courage to know that you’ll surface again when you’re ready.” When Skidmore said that, I was shocked. I was shocked because it was pretty much spot on. I’m certain that Skidmore and I will be best friends forever. Though I’ve used the phrase “best friends” numerous times, the friendship of Skidmore and I is exactly that. Even though sometimes it’s weird to realize that someone knows and understands me better than I know myself, it’s also a good thing to have since in most situations I don’t even have to explain to Skidmore why I made a certain decision or said a certain thing. She just gets me. Book World Disconnection And A Review. I’m a huge bookworm. That’s a fact. However, I’m lagging behind on my vow to read more this year. Currently, I’m only on my third book of 2012. Granted, I am a college student, so I get cut some slack, right? Anyway, I miss the book world. I’m drawn to books like kids are drawn to candy stores, and it’s hard knowing that I’ve got bigger priorities than diving into a book. responsibility can be quite a bummer, but that’s life. To five-year-old-Jack, Room is the world. . . . It’s where he was born, it’s where he and his Ma eat and sleep and play and learn. At night, his Ma shuts him safely in the wardrobe, where he is meant to be asleep when Old Nick visits. Room is home to Jack, but to Ma it’s the prison where she has been held for seven years. Through her fierce love for her son, she has created a life for him in this eleven-by-eleven-foot space. But with Jack’s curiosity building alongside her own desperation, she knows that Room cannot contain either much longer. Room is a tale at once shocking, riveting, exhilarating–a story of unconquerable love in harrowing circumstances, and of the diamond-hard bond between a mother and her child. It’s been hard since I heard so many great reviews about this book, but I just wasn’t grabbed. I felt like I got further into the book when I read the synopsis than when I read 50-60 pages of the book before deciding to give up. 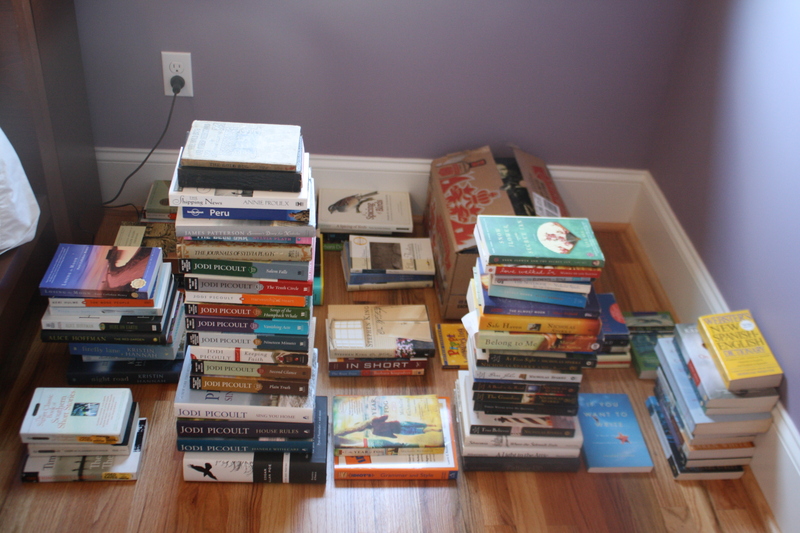 I have a pretty short fuze when it comes to books. I love the read, but if I’m not grabbed relatively quickly, I lose interest. I’m sure some people enjoyed this book (obviously), but I just couldn’t get into it. I’ll definitely be reviewing Middlesex once I finish it, so stay tuned! Musical Passion, Snow, And Lifetimes Movies. So, I went to the Marc Broussard concert last night with two of my favorite people (my uncle and his girlfriend), and it was beyond amazing. We enjoyed dinner at Salsa’s (YUM! ), and then went to the concert. We got to the Orange Peel right as the doors opened, so we got a spot right front and center. I mean, we were as close as we could possibly get, and it was amazing! The starting band was Sugar and the Hi-Lows, and they were great. I liked the main guy over the girl since I felt like he was a better singer. However, all in all, they were great. After the show, I got to talk to them and get a picture, and I actually gave each of them a hug (ya know, I just LOVE hugs too much to pass them up). My favorite song by Sugar and the Hi-Lows was “I’ve Got You Covered.” It was so beautiful, and you should definitely check it out on YouTube! By the time Marc Broussard came out, I was SO excited. He used a concept called “build the band” meaning that in the beginning he just came out by himself and sang with his acoustic guitar. He played a few songs and then slowly added one band member at a time (so some songs were played with just two or three band members, while the later songs were played with the entire band). It was a really cool concept, and Marc was amazing! I’ve only known a few other people who sound the same live as they do on their cds, and it was a really amazing experience. I mean, watching him perform just solidified how much passion he had for his music. It was like the crowd wasn’t even there. It was just him and his music, and it was incredible to watch. Other than his sound, Marc is also an amazing songwriter. There were certain instances where I just stood and listened to the lyrics, and I just cried because I realized how raw and true they were. Music like that isn’t played every day. And passion like that isn’t seen every day either. I hope one day I can find passion like that through my writing. Anyway, today started off on a good note. I woke up to snow. I had forgotten that it was supposed to snow, so it was exciting. There was only about an inch that fell, but that’s okay. Seeing it this morning and getting a few pictures before the bitter winds took hold was worth it. The day got better when I found out that there was a romance movie marathon on Lifetime. Therefore, today has been spent working on my book and watching Lifetime movies. I worked on my book until I just couldn’t anymore. I’ve been going through a lot of emotional stuff writing this book, and so I’ve had to write it in shifts. I mean, it gets to a point where I’m crying so hard that I can’t even see what I’m typing anymore. I’ll be back at it tomorrow though. I just need an emotional break from the pain of the past.